At the beginning of every December, despite a full time job, M says to himself, 'now what can I make this year?' Previous years have seen him out in his workshop in all weathers making such things as a dolls bed, a dolls clothes wardrobe, a tanker, a crane, treasure chests. Obviously, he's had to do slightly more grown up things now that the children are 15 and 18. Luckily Ella dropped a hint back in October that I managed to store in my usually quite useless memory bank. 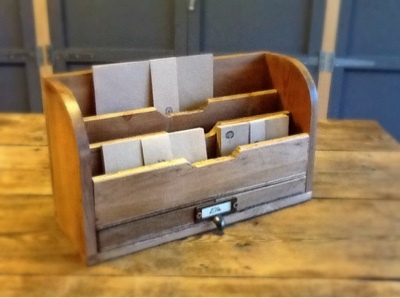 She said she'd like a letter rack to keep important correspondence in and maybe a bit of stationery too. This is what M came up with using timber from an old piece of furniture. 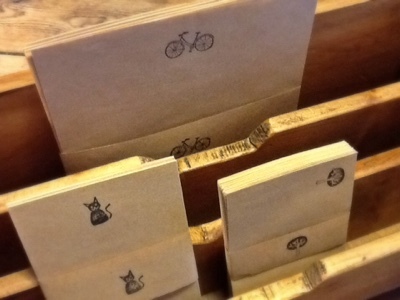 We already had the draw pull, and I had great fun making the rustic stationery with a rubber stamp set bought in Italy. It's now pride of place on her desk so I think she likes it. 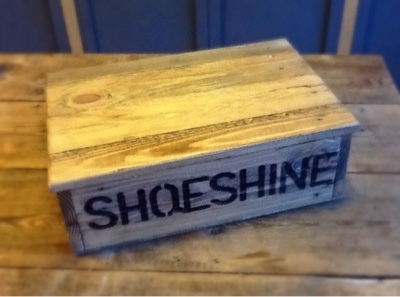 The photos don't really do the finish on J's shoeshine box justice. It's waxed and buffed and very tactile to run your hand over. Although J resisted the 'how to polish your own shoes' lesson from M, he eventually came round and now has a shoe cleaning routine which he won't thank me for sharing; every Friday after school he puts an old tea towel on the kitchen island and applies the polish, then leaves it to soak in (so he says) and then he comes back later to buff them up. (The fact that he then leaves them next to his uniform from that day fully expecting to wear it all on the following Monday is just a small detail that I'm working on.) He was really pleased to have his own supplies and box for this 'operation'. There is one more woodwork project to show you but I need a half decent photograph first. It was a joint effort, M did the woodwork and I did the distressed paint finish. These gifts are a bit like my Pom Pom hats, not instead of a proper present, just a fun extra gift. 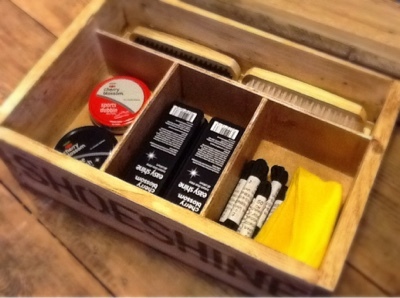 This year I'm going to suggest to M that he starts the woodwork in October to save the last minute panic on Christmas Eve! Mike is very handy with wood. I love what he's made for Hake and Ella. I like the stationery you made too.